Views ('points of view, vision, philosophies, darshanas) A vision, or point of view, means that one, depending a certain culturally transmitted form of knowledge, in one's service to it, with a personal positive perspective on it, is freed from a type of individual work load, which as well genetically as culturally is inherent to a continuing soul - or self of principles - , being a witness of changing material conditions. The intuitive basis of spiritual and analytical filognosy as a center point embedded in between philosophical considerations concerning our nature, science, politics and religion]]The syncrecy of filognosy, or the mutually favorable translation of the different humans points of view in the love of knowledge, has as its result that the basic notion of it is embedded as an atom in between the two most salient human views in life, religion at the one hand and science at the other. The international renown dutch scientist and expert in the gnostic field, Gilles Quispel, formulated gnosis as such indeed (see pict.). 1) A vision which describes the relation between spirit and matter, between teacher and pupil. This we call the analytic relationship which figures for the fundamental duality of spirit and matter which in the love of knowledge, in filognosy thus, also entails an artistic and educative/therapeutic mission to express and transmit harmony and beauty and bring about and reinforce physical and mental well-being. 2) At the other hand is there gnostically the spirituality as a culture for its own sake of being not just a form of transcendental knowing or disecting in dualities and elements, but also being a discipline to arrive at stability and happiness with that transcendence. Traditionally religious had the monks that discipline for Christinality in their grip with the rule of Benedict: obedience, poverty and chastity combined with a vegetarian diet. In the twentieth century conversant with more spiritual teachers, awoke Christianity to the notion that this rule was the spitting image of the vow of yoga (the yama) as we know from Patanjali. Thus continuing the argument intuitively are we in summary dealing with the six different visions in and around the concept of filognosy. 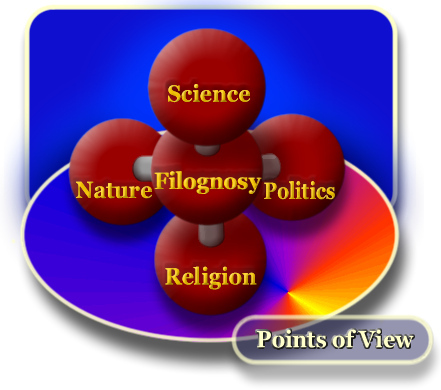 The filognosy, which 1) to the principle of the duality of spirit and matter is called analysis and 2) to the transcendence in the discipline consists of the spirituality of a certain connectedness therein, thus also aims at two points of view more that are directed at the person: 3) the politics of implementing the commentaries and 4) the religion of the service held to the honor of the hero or the sainly person, and knows further next to that two more views that are directed at the facts of 5) the philosophical line of argument of the, to the method, rationally being engaged with our nature and 6) paradigmatical science seeking unequivocalness with it in models of thought and methods of measurement. In India we retrace these six points of view in the so-called darshanas. They are the six systems of indian philosophy, syncretically considered to be complimentary rather than contradictory, despite of the diverging and sometimes contradictory nature in formulating their tenets with the concepts of âtmâ en brahma (see also 12.13: 11-12). These orthodox views have in common, together with the heterodox religiosity of the Buddhists, Jains and S'ankarists which rose in opposition with them at the time Christianity was founded a) the upanishadic notion of the cyclic of time in yugas en re√Øncarnations and b) the concept of moksha or liberation from rebirth by means of emancipation and transcendence. The six are often taken together in three fundamental dualities or basic visions of philosophy: the approaches of nondulaity and method (the scientific), the analytical and connected (the spiritual), and the ritual end exegetic (or religious). There is also a notion of progress in emancipation from high to low in this order of appearance. - 1 De Nyâya-vision of the methodical approach. Filognostically are alse included here philosophy in its entirety with for its perfect balance the spirit of hinduism itself in which these philosophies constitute the nucleus. - 2 Vais'eshika, the atomistic, undivided, vision of reality fee from illusion. Paradigmatically a model of science, a system of measurements or a science. - 3 The Sânkhya-vision of analysis in tattvas as opposed to the purusha. Also the arts belong, filognostically seen, to this department of filognosy. - 4 The vision of Yoga of transcendence in meditation in eight 'limbs ' or angas. Filognostically culminates the yoga in Christianilty in gnosis. It is the transcendendally being connected in spirituality. - 5 The Mîmâmsâ-notion of settled ceremonies and ritual services. The normal religion. To this department belongs, seen filognostically, also the autobiography and other en personality cults. - 6 The Vedânta-vision of summarizing and locally the to time and place adapting transcendental commentaries on the purâna, itihâsa and upanishadic literatures. Filognostyically belongs to this vision also the political order. - Nyâya and Vais'eshika are part of science, the way we also know it in the West; Karma-mîmâmsâ can be recognized in the practices of the civil Hindu with his mandirs and pandits, Yoga is the popular version of the spiritual discipline of connecting oneself with the Absolute and the analytical of the Sânkhya vision is incorporated in the vedântic uttara-mîmâmsâ approach we in the West know as the Hare Krishnas (see also http://bhagavata.org/glossary/k.html#Kapila Kapila and yoga; Wikipedia-Hindu philosophy). 1) The notion of a constant and continuing self or a soul (vedic: âtmâ ). 2) The concept of the cross or the workload to be carried by an individual, a family or a nation (karma). 3) The perspective of a solution of being liberated in service (moksha). 4) The recognition of an authority, of an established culture of scriptural reference (paramparâ). Filognosy described as the integrity of these views. The different forms of logic relating to these six points of view. The three basic disciplines fundamental to these visions. How we westerners in our materialism deal with these different views. See for the western-philosophical aspects of the visions furthermore the discussion of classical reference under filognosy. Gnosis as the knowledge of self-realization. The Christ of India, by Swami Nirmalananda, presents the full story of the life of Christ in India before he became a missionary-martyr of Eternal Truth (Sanatana Dharma) in the West. Included are the historical references about his life in India and the reality of the Ishanni-sampradâya - the way Hindu's became Christians (and Christians Hindus in fact) in following Him as an original teacher of the Sanatana dharma (saivite style) fundamental to the darshana's as discussed on this page; see also the pdf-download.